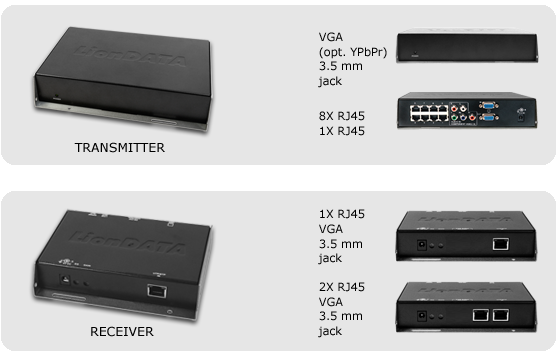 The LionDATA AVX Broadcaster is a high-end video broadcaster, which makes it possible to transmit VGA signals and audio signals to multiple monitors in a distance via CATx cables. You can choose from two different receivers for a distance up to 150 m and up to 300 m available. In addition to sharpness and brightness controls, the 300 m receiver also offers the option to correct the color skew associated with digital signage networks that operate at longer distances (RGB skew).